Utah is known as the “Beehive State” and representations of beehives are found all over different Utah signs, monuments, and buildings. The Capitol also features various beehive decorations but the most prominent are located on the Grand Staircase on the south side of the Capitol: two copper beehive sculptures. These sculptures were presented to the State of Utah in July 1976 by the Kennecott Copper Corporation and were sculpted from Utah Copper. The beehive is a symbol adopted by various religions, organizations, and people groups throughout the world’s history. The early pioneers of Utah are one of these groups, and the beehive continues to be one of Utah’s most prominent symbols. Masonic scholar Allen E. Roberts explains that a bee “works hard and tirelessly, not for himself, but for the swarm…He works in complete cooperation, and without dissension, with his fellow bees. He protects the Queen, refuses admittance to enemies, builds, makes honey, and lives in a society ruled by law.” (The Craft and Its Symbols: Opening the Door to Masonic Symbolism). Bees symbolize a community that works for the good of the whole. Each bee does its part in providing for the entire swarm. 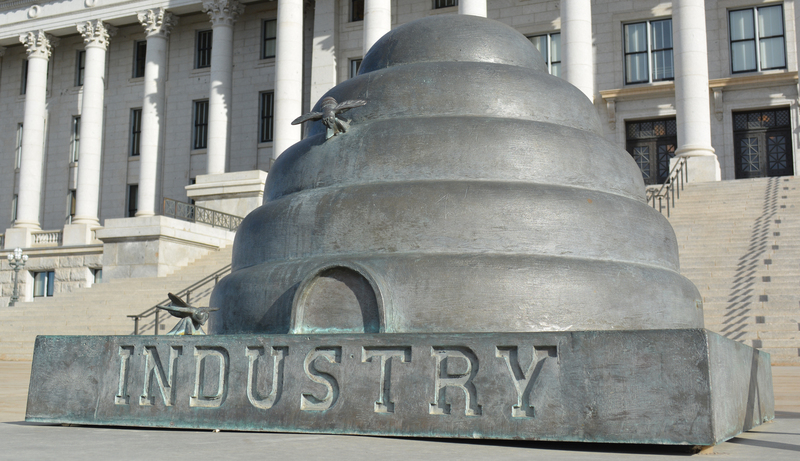 For the people of Utah, the beehive symbolizes the Utah community as each person in Utah works together to support and help one another and to create a successful industry. Industry was adopted as Utah’s state motto in 1959. It is listed on these statues as well as on Utah’s state seal and state flag. When the pioneers first arrived in Utah, there were no other immigrants living in the area. They could get some of their supplies from the Native tribes but had to rely largely on themselves to create their resources and their own businesses. This idea of industry ties in to the same symbolism of the beehive as the community banded together to help one another and create an industry that has not only lasted, but grown significantly.